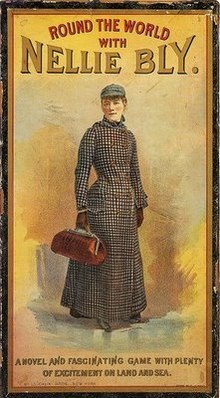 On the 14th of November 1889, journalist Nellie Bly, born Elizabeth Cochran (1864 – 1922), at just 25 years of age, began her solo travel around the world. A year earlier, Bly had suggested to her editor Pulitzer at the New York World that she was to be despatched on a trip which would turn Jules Verne’s fictional Around the World in Eighty Days (1873) into reality. So, with only two days notice, Nellie was told that she was to board the Augusta Victoria, a steamer of the Hamburg America Line which would start her 24,899-mile journey. She was actually going to beat fictional Fogg’s record of 80 days, completing the trip in 72 days. The press closely followed her preparations and the scarcity of the items she took with her was noted: a dress, a sturdy chequered overcoat, several changes of underwear and a small travel grabbag containing her toiletry essentials. The only money she took was 200 English pounds and some gold which she kept in a bag tied around her neck. The news of her departure spread and the rival paper newspaper Cosmopolitan got wind of it, setting up a counter-challenge as it sponsored its own reporter. Elizabeth Bisland was to travel round the world but in the opposite direction, endeavouring to beat the time of both Fogg and Bly. (Matthew Goodman, Eighty Days: Nellie Bly and Elizabeth Bisland’s History-Making Race Around the World, 2013). Bly’s paper the New York World had to keep their readers interested so they fought back with a “Nellie Bly Guessing Match”, setting travel prizes for the lucky readers who would come closest at estimating Bly’s exact arrival date and time. Rough Pacific seas delayed her arrival somewhat and eventually she reached New Jersey on the 25th of January 1890, at 3:51 p.m “Seventy-two days, six hours, eleven minutes and fourteen seconds after her Hoboken departure”, setting a new world record, as Bisland arrived 4 and a half days after her. Great article. My grandmother used to refer to Nellie Bly with a scandalous tone… 😀 I wanted to be that ‘scandalous’ when I grew up, too.